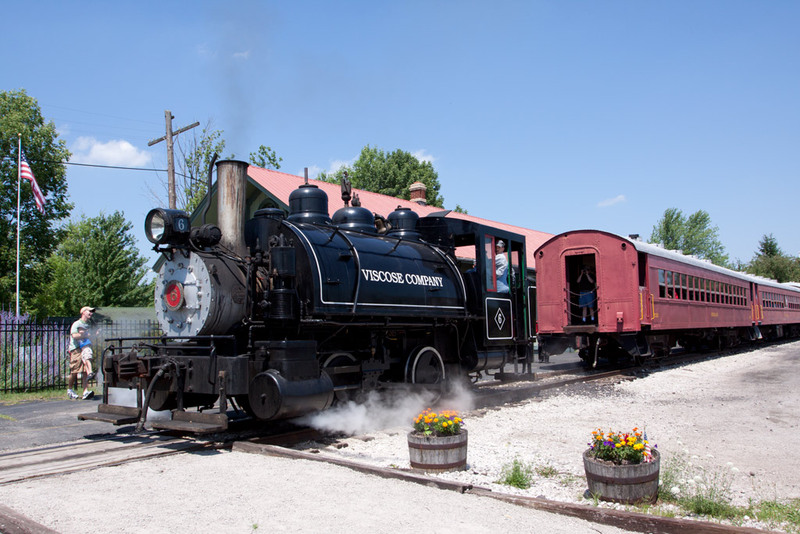 We decided as part of our vacation to head to Jefferson, Ohio, and take a ride on the excursion passenger train that operates there: the Ashtabula, Carson & Jefferson Scenic Line. As we were planning the trip we discovered, to our delight, that Saturday would be a rare opportunity to ride the train when it was being powered by a fully-restored steam locomotive instead of the usual diesel. Whoo-hoo! So we packed up our camera gear and headed out early into the muggy morning for the trip to Jefferson. We were among the first visitors to arrive at the downtown departure point due entirely to my mistake — I was under the impression the trip was to begin at 11:00 AM when, actually, it was scheduled for 1:00 PM. Oh well. We walked around the old railroad station there, strolled towards the center of town. We looked for and found a place to eat. Then headed back to the railroad. They were selling tickets and the beautiful little tank engine was nearing a full head of steam. The ride was rocky and full of steam hissing, whistle blowing, coal smoke, ash, and cinders… in other words, very enjoyable. Most fun for me was simply seeing the old engine at work and watching the various reactions children had to their experience: the full range from apathy to terror to delight. Sunday night they actually run the engine on to a specially equipped flat bed trailer, empty the boiler and coal scuttle, and drive it away. Saturday night was a scheduled Open Night at the Observatory. Even before heading out conditions were changeable. 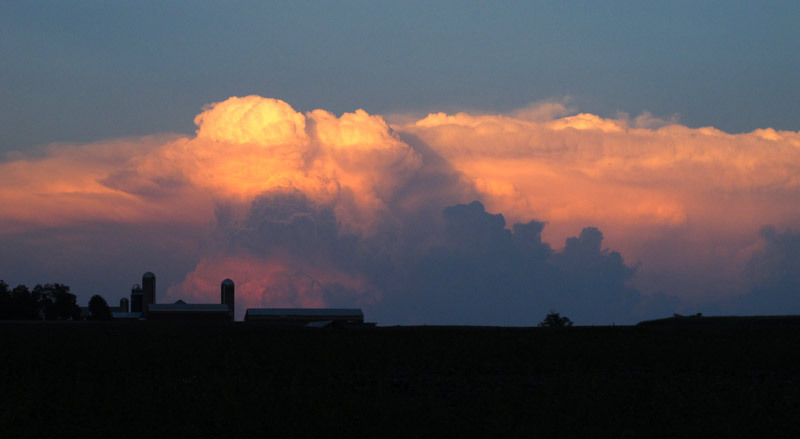 The mixed forecasts called for partly cloudy skies with the chance of isolated thunderstorms. Seeing conditions, well, the forecast was from no good to okay. Driving towards College I watched a massive thunderstorm building in the east, ahead of me, and three cloud towers billowing in the southern sky; they were all beautiful but didn't promise good skies for stargazing. I opened the Observatory and my first visitors for the night began arriving shortly thereafter. Due to neighboring trees, we hauled the portable 10-inch reflector out to the lawn to catch a look at the Moon which was floating in clear sky. Nice views enjoyed by all present. Even as we watched a shelf of clouds moved steadily from the northwest first obscuring, then covering the Moon and the rest of the sky. As a few more folks arrived we talked about telescopes and adjourned to the Observatory interior to see and discuss the big refractor. In all 23 people took a chance that the sky would be clear enough and visited. By about 10 PM we were all talked out, there were flashes of lightning in the sky along with rumbles of thunder. I closed up, picked up my gear and loaded the car. As I left I could see patches of clear sky and one of my intended showpieces –Antares, the red supergiant star in Scorpius– shining through a "sucker hole" in the southern sky. In the west, flashes of lightning. A changeable sky, indeed. I got home by midnight ending a good long day. On his last observing trip to Australia the manservant, in his astro-dweeb guise, had to observe through sucker holes most of the run. It strikes me as such a funny term. I've never been on a train excursion – of the historic kind. Too many long rides from the country to Sydney on old rattlers probably cured me of any fascination but I always enjoy other people's adventures and photos.